Cape Air and Tailwind are both looking to launch seaplane service for Boston-to-New York runs. Forget about that heliport, Boston. Seaplanes could soon be your quickest ticket to Manhattan. Cape Air just secured a crucial “letter of agreement” from the Federal Aviation Administration to fly seaplanes in the airspace over Boston’s inner harbor. The federal agency essentially ruled that the flights wouldn’t interfere with the busy traffic at Logan Airport, where Cape Air already has a big presence. The end is in sight, though. Wolf says he hopes to start offering three flights a day in each direction by sometime next summer. Service would be seasonal, with flights for about nine months a year — it’s tough to fly these planes in sub-freezing weather. The aircraft would be nine-passenger Cessna 208 Caravans; Cape Air still needs to buy or lease the two planes it needs. Wolf says the one-way price would be in the $300-to-$400 range because he wants to stay competitive with the walk-up fares for LaGuardia shuttles at Logan. Of course, the real appeal is this: getting to Manhattan from the Seaport in 70 minutes or so, without the hassles of navigating airports or getting to and from them. Another company may be hot on Cape Air’s tail. 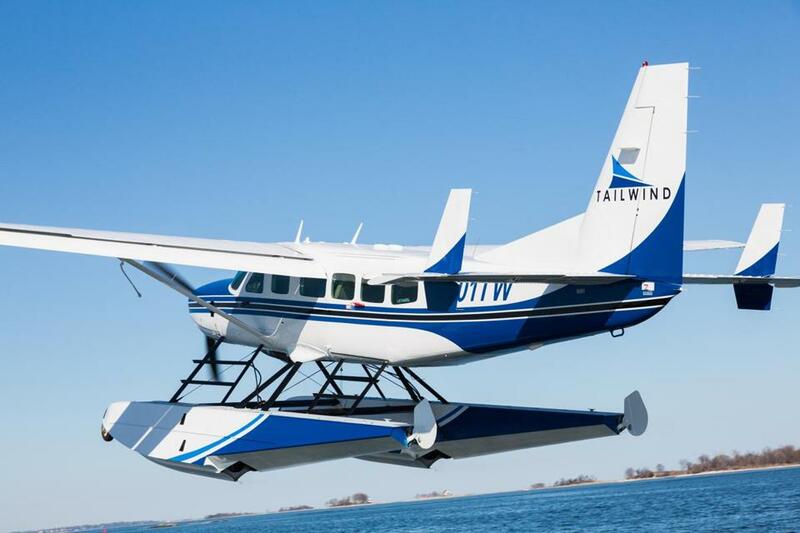 Alan Ram, of Tailwind Air, says he expects to secure his company’s FAA letter for Boston seaplanes by the end of the year, with a goal of starting flights next summer. He expects the pricing would be similar to Cape Air’s. There’s enough room in this market, he says, for both operators. A number of business leaders in Boston have long wanted a way to get to NYC in a hurry, without the usual airport headaches. But the city has been without a general purpose helipad for roughly two decades. Some had hoped that General Electric’s arrival in town two years ago would prompt movement on that front. But the idea kicked up an uproar in South Boston, and GE quickly backed away. Seaplanes, Wolf is quick to point out, have a much smaller impact than choppers. There would probably be fewer flights, for example, and none at night. Wolf, a former state senator from Cape Cod, says his team has held more than 90 meetings in and around Boston to discuss the concept, address community concerns, and get feedback. Wolf started down this runway at least five years ago, first meeting with former mayor Tom Menino to sound out the idea. Now, Wolf hopes to complete the journey under Mayor Marty Walsh’s watch. There’s no rush for Cape Air, he says. Wolf is a trained pilot, as well as a CEO. In both roles, he has learned the importance of a proper takeoff.